With the start of a new year, I have been reflecting on how my personal history led me to my current work. I’ve always had an interest in workers’ rights; my grandfather was the last generation within our family to work in the Pennsylvania coal mines before moving on to a career in civil service. My grandmother, a factory worker, was an active union member. Growing up, family dinners included conversations about current events and politics, and stories of how generations before me were raised. These conversations instilled in me empathy, respect, and a belief that everyone deserves a fair chance to thrive. To advance health equity and justice, we need to continue to support and expand progressive federal, state, and local policies that provide resources to help historically underserved communities—often communities of color—thrive. My thinking on human rights, workers’ rights and health care policy were further influenced by formative texts like Barbara Ehrenreich’s Nickel and Dimed: On (Not) Getting By in America and Michael Moore’s documentary film, Sicko. My pursuit of a Master’s in Public Administration solidified my nonprofit and public health career and my commitment to initiatives that help families reach their full health potential. The conditions in which we are born, grow, live, work, and age impact our health. Conditions such as economic stability, physical environment, education, food, and access to care all support or inhibit our health. 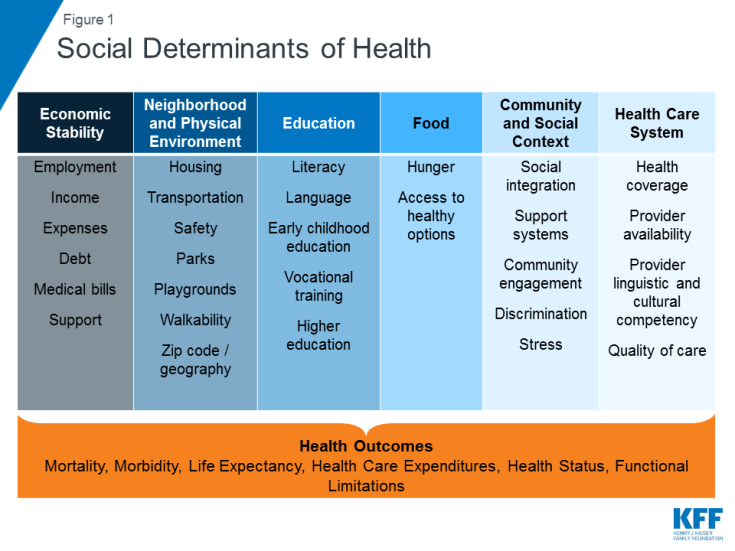 In the public health community, these conditions are known as the social determinants of health (see figure below)1. If a family cannot afford childcare or cannot find a nearby facility with open spots, one parent needs to stay home to care for the children. The family misses out on income opportunity, forced to live off of one salary. Missed opportunities for income generation mean less resources to pay for groceries, medical costs, housing, and other basic necessities. Less income means that a family could be forced to skip a needed prescription for a child, impacting the child’s health, as well as school attendance and performance. All of this assumes that a job with a living wage is even available, which often times in working class communities, it is not. This is just one example of how an issue not otherwise related to one person’s health, in this case childcare, cascades to impact health and overall well-being of a larger group. In San Francisco, zip code 94129, 84.9% of residents are white, only 3.1% of the population is in poverty2, and life expectancy is 84.3 years3. In East Oakland, zip code 94621, 36.5% of the population is Black or African American, 54.8% are Hispanic or Latino2, 30.7% of the population lives in poverty, and life expectancy is 74.3 years3. In other words, white families who live in areas with increased household incomes will live longer than their low-income, Hispanic or Latino and Black or African American neighbors across the Bay. When we have successfully achieved health equity, everyone will have the opportunity to reach their full health potential without disadvantages stemming from social conditions. To advance health equity and justice, we need to continue to support and expand progressive federal, state, and local policies that provide resources to help historically underserved communities—often communities of color—thrive. This means promoting and adopting policies to increase access, affordability and quality for education, child care, housing, economic revitalization, and more. California’s new Governor, Gavin Newsom, recently led by example in this area by appointing the state’s first ever surgeon general to urge policymakers at every level of government and leaders across the state to consider the social determinants of health, especially for children5. In addition to policy advocacy and implementation, we also need to embrace compassion and empathy to develop a shared understanding that as a country, we must listen to one another, respect one another, and empower those most vulnerable. In my current role, I leverage both my passion for health equity and collaboration to create policy change. Tides knows that complex social problems simply cannot be solved by a single funder or organization. This is especially true when it comes to achieving health equity. Health inequities are so deeply-rooted and so severe that it is going to take coordinated, multi-sector effort that bridges silos and inspire a shared vision to create lasting change. It’s exciting to be part of an organization that recognizes healthy individuals and communities are key to achieving a world of shared prosperity and social justice. In partnership with the Robert Wood Johnson Foundation (RWJF), my time this year will be spent facilitating the ongoing alignment, collaboration, and integration of work across a group of nonprofits advancing policies at the local, state and federal level (such as Head Start, Supplemental Nutrition Assistance Program, Medicaid, etc.) to promote healthy, safe, and stable environments for all children and their families. I’m excited to leverage Tides’ experience facilitating collaboration and commitment to advancing health equity to break down silos between stakeholders and sectors in support of positive impact. Tides’ work with RWJF is just one example of a long history supporting collaborations addressing health inequities. Another Tides partner in the health equity space is the Center for Care Innovations (CCI). In an effort to reduce the risk of chronic disease later in life for all children to have healthy and vibrant futures, the Center for Care Innovations, in partnership with Genentech Charitable Giving, has launched the Resilient Beginnings Collaborative to improve the capacity of San Francisco Bay Area safety net providers to prevent, screen, and treat childhood adversity in pediatric care settings. Through a learning collaborative, seven participating safety net clinics are implementing tools to address trauma and promote resilience, with opportunities to learn from other clinics facing the same challenges through monthly webinars and in-person meetings. CCI itself was launched in 1999 through a collaborative grantmaking partnership between The California Endowment and Tides. I am thrilled to be in a role that combines my passions for health equity and facilitating collaboration. The examples I outlined above – of coordinated, collaborative efforts working to advance health equity – remind me that we can achieve more together than we can individually. 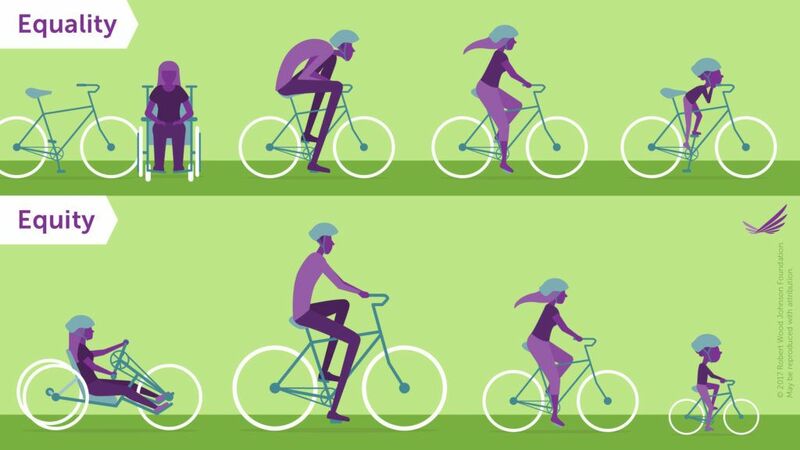 The reason health equity matters is simple: health is a basic human right. Maria Smith joined Tides in 2018 as the program manager for the Robert Wood Johnson Foundation Healthy Children, Healthy Weight collaborative initiative at Tides Center.